Saint-Petersburg, the home city of the young motorcycle rider Makar Yurchenko, welcomed the 6th stage of Russian Supermoto and Minimotard Championships. 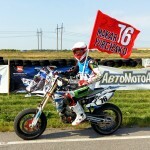 The home-stage brought Yurchenko a title of a new Russian Supermoto Champion 2015 by overall standings. Despite the fact that there is 1 more stage left in Kursk, September 2015, its result won’t influence the final results of the rider. 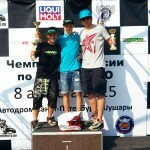 Makar Yurchenko – is the first Russian rider to perform in Red Bull MotoGP Rookies Cup. The next 7 & 8 stages of championship will take place in Brno, Czech Republic, on 15-16 of August. You may proceed to official Red Bull TV Channel to watch races online by link: www.redbull.tv.